Team uses detailed data to create a virtual-reality display of what’s left after explosion. Wearing VR goggles Kim Arcand views a 3-D representation of the Cassiopeia A supernova remnant, pictured above, at the YURT VR Cave at Brown. “Our universe is dynamic and 3-D, but we don’t get that when we are constantly looking at things” in two dimensions, said Arcand, the visualization lead at CfA. The project builds on previous research done on Cas A, as it’s commonly known, that first rendered the dead star into a 3-D model using the X-ray and optical data from multiple telescopes. Arcand and her team used that data to convert the model into a VR experience by using MinVR and VTK, two data visualization platforms. The coding work was primarily handled by Brown computer science senior Elaine Jiang, a co-author on the paper. The VR experience lets users walk inside a colorful digital rendering of the stellar explosion and engage with parts of it while reading short captions identifying the materials they see. 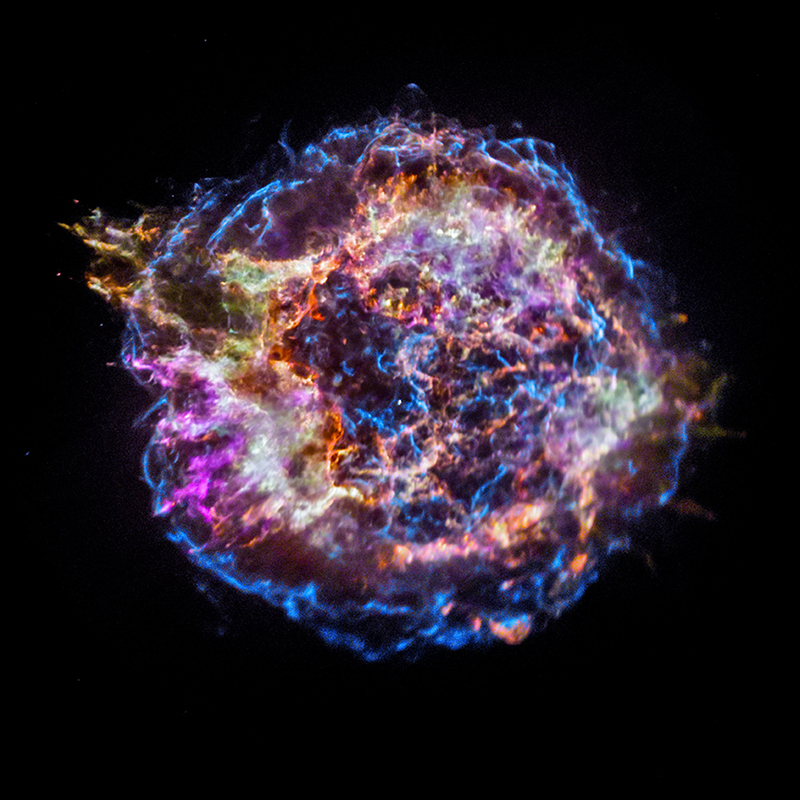 “Astronomers have long studied supernova remnants to better understand exactly how stars produce and disseminate many of the elements observed on Earth and in the cosmos at large,” Arcand said. When stars explode, they expel all of their elements into the universe. In essence, they help create the elements of life, from the iron in our blood to the calcium in our bones. All of that, researchers believe, comes from previous generations of exploded stars. In the 3-D model of Cas A, and now in the VR model, elements such as iron, silicon, and sulfur are represented by different colors. Seeing it in 3-D throws Cas A into fresh perspective, even for longtime researchers and astronomers who build models of supernova explosions. The VR platforms also opens understanding of the supernova remnant, which is the strongest radio source beyond our solar system, to new audiences. VR versions of Cas A are available by request for a VR cave (a specially made room in which the floors and walls are projection screens), as well as on Oculus Rift, a VR computer platform. As part of this project, the team also created a version that works with Google Cardboard or similar smartphone platforms. In a separate but related project, Arcand and a team from CfA worked with the Smithsonian Learning Lab to create a browser-based, interactive, 3-D application and 360-degree video of Cas A that works with Google Cardboard and similar platforms. “My whole career has been looking at data and how we take data and make it accessible or visualize it in a way that adds meaning to it that’s still scientific,” Arcand said. VR is an almost perfect avenue for this approach, since it has been surging in popularity as both entertainment and an educational tool. It has been used to help medical staff prepare for surgeries, for example, and video game companies have used it to add excitement and immersion to popular games. Arcand hopes to make Cas A accessible to even more people, such as the visually impaired, by adding sound elements to the colors in the model. Reaction to the VR experience has been overwhelmingly positive, Arcand said. Experts and non-experts alike are hit by what Arcand calls “awe moments” of being inside and learning about something so massive and far away. “Who doesn’t want to walk inside a dead star?” Arcand said. 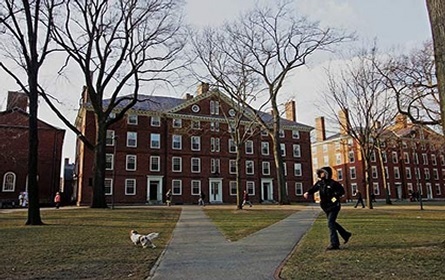 Harvard University is the oldest institution of higher education in the United States, established in 1636 by vote of the Great and General Court of the Massachusetts Bay Colony. It was named after the College’s first benefactor, the young minister John Harvard of Charlestown, who upon his death in 1638 left his library and half his estate to the institution. A statue of John Harvard stands today in front of University Hall in Harvard Yard, and is perhaps the University’s best known landmark.